Our trained nurses can assist in the proper vascular access device selection and care. Ultrasound guided and 3CG placement verified insertion of a Power PICC for long-term access of >15 days. Ultrasound guided insertion of midline catheter for access < 14 days. Ultrasound guided insertion of catheter for access of 6-14 days. Restore patency to a catheter with a blood or chemical occlusion. 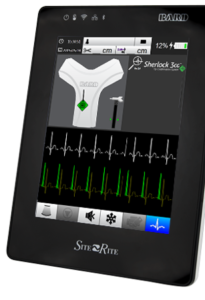 The Site~Rite 8 Ultrasound System with Pinpoint GT Technology and Integrated Sherlock 3CG Diamond TCS allows for our experienced nurse to provide bedside placement and verification of PICC Lines. This is accomplished by getting simultaneous views of both catheter tip tracking and the patient’s electrocardiogram (ECG), allowing our nurses to navigate the catheter tip into the SVC and confirm catheter placement in proximity to the CAJ using ECG technology. This allows for the near elimination of x-ray placement verification, which usually adds over 2 hours before medication can be administered. This improves patient care by decreasing time to administer treatment eliminates the exposure to radiation, and reduces the cost of treatment.